Previously, session recording started strictly at the very beginning of sessions that met the recording policies and stopped strictly when those sessions ended. Starting with the 7.18 release, Citrix introduces the dynamic session recording feature. With this feature, you can start or stop recording a specific session or sessions that a specific user launches, at any time during the sessions. To make the feature work as expected, upgrade Session Recording, VDA and Delivery Controller to Version 7.18 or later. On the Session Recording Agent, a registry key is added for enabling or disabling the feature. The key is set to 1 by default, which means that after installation or upgrade to 7.18, the feature is enabled by default. Set the value of DynamicControlAllowed to 0 or use the default value, 1. Restart the Session Recording Agent to make your setting take effect. If you are using MCS or PVS for deployment, change the setting on your master image and perform an update to make your change take effect. Incorrectly editing the registry can cause serious problems that might require you to reinstall your operating system. Citrix cannot guarantee that problems resulting from the incorrect use of Registry Editor can be solved. Use Registry Editor at your own risk. Be sure to back up the registry before you edit it. The following table lists three PowerShell commands added in the Citrix Broker SDK for the dynamic session recording feature. For information on the Citrix Broker SDK, see Citrix SDKs and APIs and Citrix Virtual Apps and Desktops SDK. Start-BrokerSessionRecording Lets you start recording a specific active session, a list of active sessions, or sessions launched by a specific user. For more information, run Get-Help Start-BrokerSessionRecording to see the command online help. Stop-BrokerSessionRecording Lets you stop recording a specific active session, a list of active sessions, or sessions launched by a specific user. For more information, run Get-Help Stop-BrokerSessionRecording to see the command online help. Get-BrokerSessionRecordingStatus Lets you get the recording status of a specific active session. For more information, run Get-Help Get-BrokerSessionRecordingStatus to see the command online help. Launch PowerShell from the Citrix Studio console. Use the Get-BrokerSession command to get all active sessions of the target user. Use the Get-BrokerSessionRecordingStatus command to get the recording status of the specified session. The -Session parameter can accept only one session Uid at a time. Use the Start-BrokerSessionRecording command to start recording. By default, a notification message appears to inform users of the recording activity. The following table shows common ways of using the Start-BrokerSessionRecording command. Start-BrokerSessionRecording -User DomainA \ UserA Starts recording all sessions of user UserA in the domain named DomainA and notifies UserA. Start-BrokerSessionRecording -User DomainA \ UserA -NotifyUser $false Starts recording all sessions of user UserA in the domain named DomainA and does not notify UserA. Start-BrokerSessionRecording -Sessions $SessionObject Starts recording all sessions in the object named $SessionObject and notifies the user. To get the object $SessionObject, run $SessionObject=Get-BrokerSession –username UserA. The name of an object is prefixed with a dollar sign $. For more information, see Step 2 and the command online help. Start-BrokerSessionRecording -Sessions uid1,uid2,…,uidn Starts recording the sessions uid1, uid2, … , and uidn, and notifies the users. Use the Get-BrokerSessionRecordingStatus command to get the recording status of each target session. The status is supposed to be SessionBeingRecorded. Play back the Live or Complete recordings in the Session Recording Player and proceed with the follow-up troubleshooting. The last section of the timeline on the Player progress bar might show gray when you play back a “Complete” recording ended by the Stop-BrokerSessionRecording command and the last section of the recorded session is idle. It is not obvious when the recorded session has constant activities. Use the Stop-BrokerSessionRecording command to stop recording when the reported issue has been triaged or resolved. Stop-BrokerSessionRecording -User DomainA \ UserA Stops recording all sessions of user UserA in the domain named DomainA. Stop-BrokerSessionRecording -Sessions $SessionObject Stops recording all sessions in the $SessionObject. Stop-BrokerSessionRecording -Sessions uid1,uid2,…,uidn Stops recording the sessions uid1, uid2, … , and uidn. 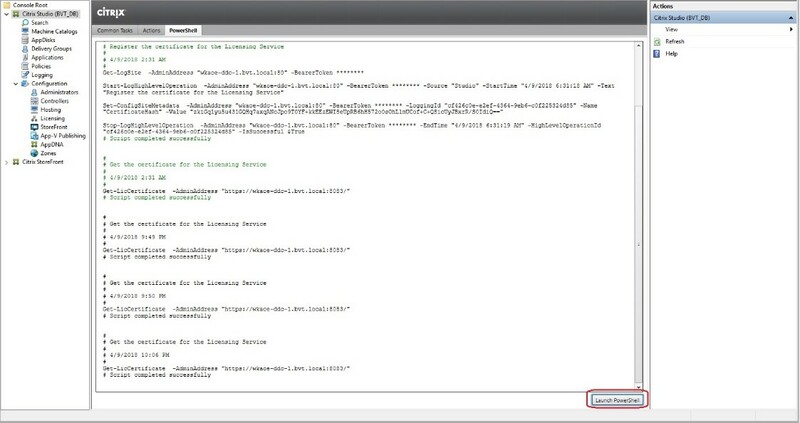 On the Citrix Studio Logging screen, you can view the resulting logs of the Start-BrokerSessionRecording and Stop-BrokerSessionRecording commands.